This is one of several posts I’m doing to highlight how livable my RV rig Tardis is for such a small motorhome. I’m very pleased with the quality and thoughtful features designed into this 23.5 ft. Lazy Daze Twin-King model. The head or bathroom is right behind the driver’s seat. It is a dry bath which means the shower and toilet are separate. It is small yet sufficient for my needs. I don’t plan on spending any more time in it than necessary; so, there’s no point in having a large one. The 3 ft shower is almost as big as the one I had in the sticks-n-bricks. It’s one piece molded fiberglass which makes it real easy to clean. Inside it is a window that opens and a ceiling exhaust vent. 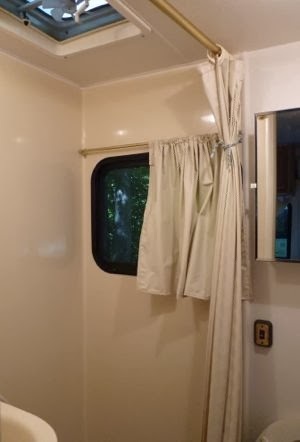 Vinyl curtains cover the window and shower entry. I usually take a ‘navy’ shower; wet myself down then turn off water, soap and scrub, then rinse off with the shower wand that hangs above the sink. This method uses very little water which is good practice for boondocking. A small sink is inside the shower opposite the window, with a ceiling light above. It’s little; but, sufficient for shaving, brushing teeth and washing. Dirty clothes are kept in a mesh laundry sack which sets under the sink on the shower floor. It’s usually only there for a few days, as I normally wash clothes when I have one or two loads. I like doing it at state or national parks because their coin machines are generally much cheaper than commercial laundromats. To the right of the shower is a Sealand ceramic flush toilet. 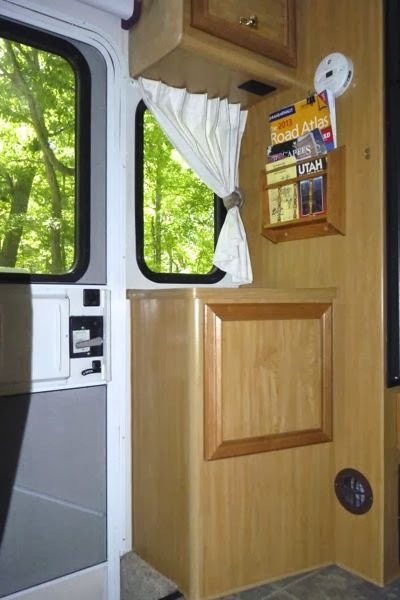 An RV toilet uses a foot pedal and gravity to flush so only a minimum amount of water is needed. A spray wand is used to rinse the bowl, and a small pool of water is left over the valve to keep odors away. The toilet paper holder is up under the sink which keeps it dry. 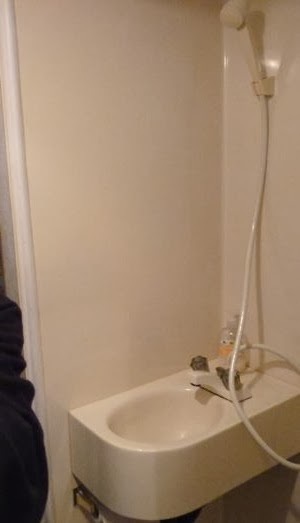 There is another light on the ceiling over the toilet. Above and behind the toilet is a standard medicine cabinet with mirror, and a latch on the door. I’ll be adding retainers to prevent items from falling out. It is small yet sufficient to hold my toiletries. On the right of the pix, you can see towels hanging on the inside of the bath door. The outside of the door holds a full-length mirror. And look closely, below and to the right of the toilet, and you will see where I store extra toilet tissue. Notice the square on the wall to the right. That is a nifty movable panel that allows the driver’s seat (which is just on the other side) to move back a bit more. I’m short so it is of no use to me; but, for a taller person it’s a pretty neat feature. There are two cabinets just outside the head; the top is used for linen and towels and the the bottom stores finished paintings. On the right wall is a magazine rack, which mostly holds maps and travel booklets. The white circle above is the carbon monoxide (CO) alarm. The dark circle below is a vent for the furnace. On the left is the entry door which is just behind the passenger seat. Barely visible over the door is a cubby hole, and a retractible blind that can cover the door window. There is a light in the step down, and another on the ceiling over this area. The floor in the bath and entry is linoleum with a faux tile pattern. With a one piece shower and sink, the head is very easy to keep clean. 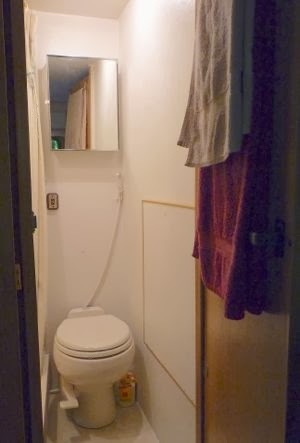 The bathroom has everything I need in a compact space; for one person it works just just fine. For more posts that explain other aspects of the rig go to the Tardis page.